Receive payments in Canadian Dollars from Amazon Canada! Editor’s Note: The CAD Receiving Accounts Service is currently available by request only. Eligibility requirements for this service vary and may change as we continue to roll out this service. Are you selling online to US customers? Looking to expand sales to her friendly neighbor to the north? Good news! Payoneer users can now get access to Canadian dollar (CAD) receiving accounts, opening up a whole new facet of the eCommerce world. 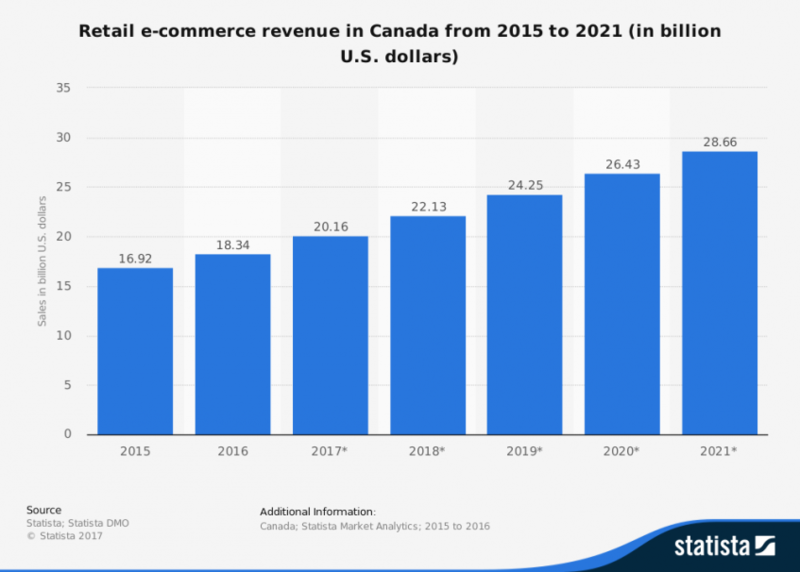 Canada’s eCommerce scene is seeing rapid growth, with an estimated $20.1 bn in revenues in 2017. This number is expected to grow by around 42% to a staggering $28.6 bn in 2021. Amazon.ca is the biggest eCommerce site in Canada (similarly to the US), and is constantly expanding its services and products offering to its Canadian shoppers. Amazon Prime memberships are available on Amazon.ca, and the recent Prime Day saw unprecedented sales, making it the biggest shopping day for Amazon.ca to date. Amazon Prime FREE Next-Day Shipping has been expanded to several regions in Canada as recently as this past July, offering the service to residents of Toronto, Montreal, Calgary, Edmonton, Vancouver, and Ottawa-Gatineau. Though Canada covers a lot of territory, the population is relatively small: recent estimates put the Canadian population at 36.68 million. This is a mere 11% of the size of the neighboring US population. Taking this into account $20.1 bn in eCommerce spending is quite impressive. Such a small population hasn’t been a huge draw for eSellers up until this point, especially considering the hassle of having to deal with the shipping costs and CAD/USD currency conversion issues. For this reason, there is fairly low competition for sellers on Amazon.ca at the moment, and the time to get a piece of the pie is now. What goods do Canadians buy on Amazon.ca? During Prime Day 2017, the best-selling items were the Kindle Paperwhite, the Xbox One S 500GB, and the Instant Pot Duo 80 7-in-1 Multi-Use Programmable Pressure Cooker. How can I receive Canadian Dollars via Payoneer when I sell on Amazon.ca? Are you selling on Amazon.com, Amazon.co.uk, Amazon.de or any other Amazon domain? You’re likely going to need a local bank account for each marketplace (sometimes you’ll be able to use your own local bank account wherever you live, but it will cost you high fees). Payoneer provides its users with local receiving accounts in multiple currencies, to make receiving payments easy, fast, and inexpensive. Payoneer already offers its users receiving accounts for USD, EUR, GBP, JPY, MXN and CNH, and is now offering receiving accounts in CAD and AUD as well. This opens up an opportunity for sellers to sell on Amazon.ca with a local Canadian receiving account for Canadian dollars. Funds received via Amazon.ca to your CAD receiving account will be available in your Payoneer account for you to access at any time; you can withdraw them to your local bank in your local currency whenever you wish. Payoneer users – get started with a FREE CAD receiving account! Not yet a Payoneer user? Sign up today for FREE!